2019 is probably the best time to give wings to your passion, and if your passion involves grooving to good music, and sweating it out while having fun, hit up one of these dance studios and show some moves. If you think you have two left feet, don’t worry because the choreographers here don’t believe in that concept at all. Ram’s Step Up Dance Company in Madhapur is one of the well-known dance studios in Hyderabad. 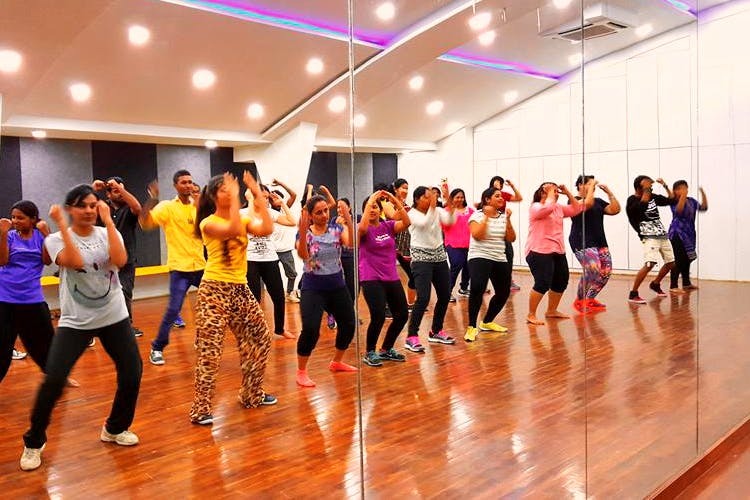 This dance studio conducts classes for various dance forms including Bollywood, B-Boying, Hip-Hop, Locking Popping, Zumba, Kathak, Salsa, Contemporary, and Hula Hoop. Catering to almost all age groups, there are special batches for kiddies at this dance studio too. You can also avail professional choreography for events like weddings, corporate events, school functions, and college festivals. This dance studio believes that everyone understands music, and that it can move your soul. They aim to be your guide when it comes to expressing how you feel the music through different dance forms like Zumba, Capoeira, Bollywood, Salsa, Hip-hop, and Contemporary. You can find the full schedule on their website and register for any of their one-two hour long batches. It costs around INR 2,000 for 12 classes over a period of one month (for all dance forms except salsa). Salsa classes are held over a duration of two months and cost INR 3,500. This academy was established in 2010. However, a full-fledged studio in Secunderabad with state-of-the-art facilities was only set up in 2013 and it has won multiple awards for its choreography in the past years. A group of passionate dance instructors teach western (hip-hop, contemporary, salsa) Bollywood, Tollywood as well as classical dance forms (as of now, they have classes for Bharatnatyam only) over the week. Batches are based on the age group and your focus. If fitness is what you’re after, you’d have to join their morning batch as opposed to the evening batch where the focus is more on the style of dance. International dancers too, often conduct workshops at this studio, so you’re meeting international standards of dance from here. They also have yoga classes early every morning from 6am – 7am (INR 2,000 per month). However, it costs INR 1,500 per month for kids between 4-13 years. This studio is popular for the Zumba classes which are power-packed and super fun. Attendees swear by the professionalism here and take it on as a stress buster. Apart from Zumba, you can also learn freestyle, Bollywood, Trumping, and Hip-hop styles of dance here. So send your kiddies to learn these dance-styles while you can get your fancy fitness routine right. Win-win, isn’t it? The classes happen throughout the week, from Monday to Friday, and anyone above the age of four can register. It costs around INR 2,500 per month.